The new Jazzbit season will kick off with our neighbours from Poland! This September our senses will be caressed by the most interesting Polish musicians of newer generation. At Jazz Dock as usual! In Poland, during the interwar period, improvised music and jazz became a medium of multi-layered messages, providing numerous memorable works of art. Polish Jazz 1918 - 2018, a project lead by Club Firlej from Wrocław, invited consequently avant-garde young artists to interpret tradition in a visionary way thanks to their creativity and imagination. 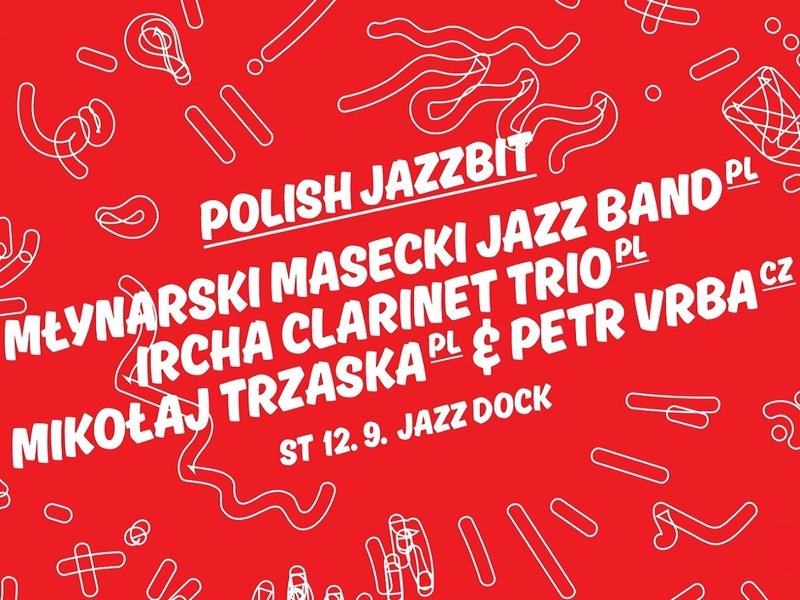 We will experience non-generic, modern interpretations of classic songs from the 30's performed by the phenomenal Jazz Band Młynarski Masecki, get mesmerized by Ircha Clarinet Trio and dazzled by the first time ever collaborative performance of Mikołaj Trzaska & Petr Vrba. That's what the press says. At Jazz Dock you can find out for yourselves. This is a join project of the most acclaimed pianist Martin Masecki and a percussionist and singer Jan Emil Młynarski. Together they are reviving the old tradition of Polish interwar jazz orchestras while not hesitating to break conventions or throw a crazy free jazz improvisation. Jazz Dock's getting mesmerized the same night by the clarinet trio of Mikołaj Trzaska with their original compositions and magical songs. Those originate from various Central European and Near-Eastern traditions that invoke memories and a picturesque atmosphere of the diverse and attractive world of the interwar Poland. A collaboration of two figures with very interesting history & background. Mikołaj Trzaska is a legend of the Polish impro scene - composer, saxophonist and bass clarinetist. Petr Vrba is widely recognised for his experiments in free improvisation in which he uses a trumpet, clarinet, vibrating speakers and various found items. For the first time ever, they will perform together at this special event! The project has been realized in the frame of the Cultural Bridges grant scheme of the Adam Mickiewicz Institute, co-financed by the Ministry of Culture and National Heritage of Poland, as part of its 2017–2021 long-term program NIEPODLEGŁA (Independent). Whole evening admission: under 26 - CZK 150, older than 26 - CZK 250. Seating one price: CZK 350.